Edited and with an introduction from Andrew O'Day, the book is published to celebrate the Doctor's 50th anniversary and provides a valuable record of the current Matt Smith Doctor, who arrived in 2010 and is still travelling in time and space. 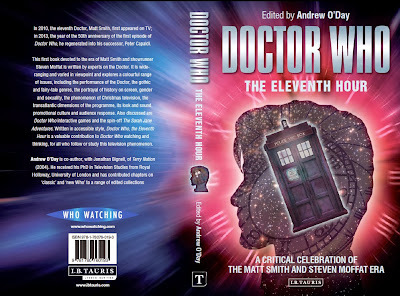 This first book devoted solely to the Steven Moffat/Matt Smith era is written by experts on the Doctor and includes contributions from Richard Hewett, Frank Collins (that's me), Matthew Kilburn, Dee Amy-Chinn, David Budgen, Simone Knox, Jonathan Bignell, Piers D. Britton, Vasco Hexel, Matt Hills, Brigid Cherry, Neil Perryman, and Ross P. Garner. Doctor Who - The Eleventh Hour: A Critical Celebration of the Matt Smith and Steven Moffat Era is wide-ranging and varied in viewpoint and explores such issues as the performance of the Doctor, the gothic and fairy tale genres, the portrayal of history on screen, gender and sexuality, the phenomenon of Christmas television, the transatlantic dimensions of the programme, its look and sound, promotional culture and audience response. Also discussed are Doctor Who interactive games and the spin-off The Sarah Jane Adventures. Written in accessible style, the book will be a valuable contribution to the expanding literature on Doctor Who, for fans, watchers of sci fi TV and students alike. "Why so many books on the Doctor at I.B.Tauris? Why the ongoing 'Who Watching' project? Well, the Doctor is central to contemporary media, and remarkably almost spans the history of television itself. Written for a receptive audience of fans and students, they have been warmly welcomed and have helped form a community, engaged in an argumentative dialogue about the history and future of the Doctor. Intelligent and loyal, with deep, deep knowledge of their field, provocative in their views, discriminating and critical too – Doctor Who fans keep us on our toes to publish the best writing on and thinking about this extraordinary phenomenon." Check out the 'Who Watching' website for reviews of the current series and articles from authors in their published range on many aspects of classic and current Doctor Who.